VietNamNet Bridge - Most of the rubber trees grown on the dipterocarp forest in Ea Sup and Buon Don districts of Dak Lak province have been developing slowly, as the environment in the districts has changed, causing difficulties for production and people’s lives. Despite warnings, in November 2009, the Dak Lak provincial People’s Committee approved a plan to develop a rubber growing area in 2009-2020, under which 8,000 hectares of dipterocarp forest in Ea Sup and Buon Don districts will be used to grow rubber. Prior to that, meetings and workshops were organized where scientist warned that dipterocarp is a specific forest ecosystem formed in very harsh conditions. Therefore, dipterocarp forests grow very slowly and should not be replaced with other kinds of trees. Ton Nu Tuan Nam from the Western Highlands Agriculture & Forestry Science Institute (WASI) said the soil and climate conditions in the Ea Sup dipterocarp forest s severe, while the cultivation layer of soil for cultivation is thin. There is high possibility of flooding in the rainy season. The evaporation and high temperature in the dry season will also affect growth and development of many crops, especially long-term industrial ones such as rubber, cashew and coffee. Most of the rubber trees grown on the dipterocarp forest in Ea Sup and Buon Don districts of Dak Lak province have been developing slowly, as the environment in the districts has changed, causing difficulties for production and people’s lives. Trinh Cong Tu from the Soils and Fertilizers division also warned that dipterocarp forest land has discrete soil structure and poor nutrition, so rubber trees are prone to fall during the flooding season. There are over 4,525 hectares of rubbers trees being grown mostly on dipterocarp forestland, including 3,525 hectares in Eas Sup district. In 2009-2014, businesses and households rushed to grow rubber because rubber latex prices escalated rapidly. According to Ea Le commune authorities, people cleared forests to grow 500 hectares on dipterocarp forest land. The rubber trees grew well in the first three years, but they became stunted in the fourth year. Pham Van Thuoc, chair of Cu M’Lan Commune, confirmed that thousands of hectares of dipterocarp were cleared to grow 700 hectares of cashew trees. As cashew trees did not bring profits, people chopped down the trees to grow rubber. However, rubber trees also could not grow. Many farmers decided to fell rubber trees to grow maize and cassava. Not only households but businesses as well have given up rubber forests because they cannot see bright prospects. 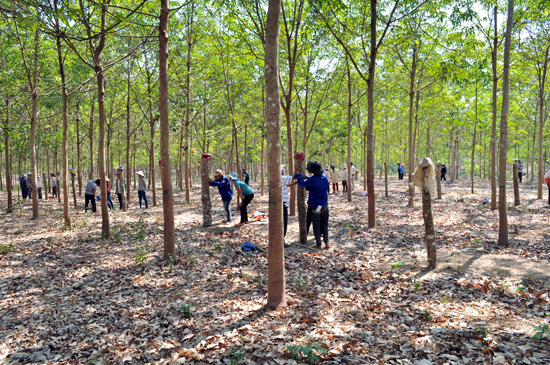 The 100 hectare rubber forest planted by Anh Quoc Company is dying. While locals cannot get benefits from rubber trees, they have suffered from ecological changes. Unlike previous years, Ea Sup has suffered from heavy floods in recent years in the rainy season.